Get away from the city life and escape to Creek In The Wild where you can unwind by the river, relax in Kerala-style cottages and trek till you find your way back to the homestay. Hidden in the lush Brahmagiri hills of Wayanad, Creek In The Wild is an idyllic resort, smack in the jungles. True to its name, the property even has a little creek that you can picnic by, or better still, paddle and splash about in. 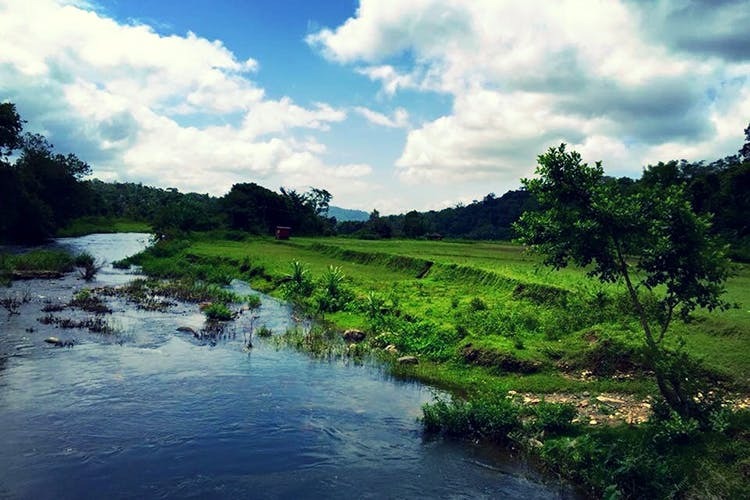 With the rolling hills on one side, and paddy fields on the other, you might want to spend all your time outdoors. They organise safaris, nature walks for the noobs, and proper treks for the adventurous as well as village walks that will give you a glimpse into the life of local. Apparently, it is also a bird watching paradise, so take those binoculars along. Our favourite time to just lie on our backs and gaze at infinity is dusk. Watch the glow of the sunset give way to stark darkness and then a canopy of twinkling stars...it’s beautiful. It’s even romantic, so if you’re planning to pop the question, this might be a good spot to do so! Cottages are rustic, and made in the typical Kerala-style Ezhamuri ones. This means basic furniture, but with windows that overlook the gorgeous terrain. Don’t worry about food either. They serve authentic Kerala cuisine, with ingredients freshly sourced from the regions. Almost farm to fork! You’ll feel so in sync with nature, coming back to the concrete jungles of the city will be a task. Trust us, we speak from experience! The rooms can get a bit musty in the monsoon and well as peak summer. Be sure to leave the windows open, but close them at dusk or you’ll have many mosquitoes for roommates!